Project stream to REACH New Heights! Streaming has been the greatest invention since the internet or at least in my view. There is no hassle of downloading just the need for an internet connection. You can then watch your favorite shows, movies or listen to your favorite songs all without any problems. But that is not all streaming can do. Google plans on pushing the limits of streaming even further with its project stream operations. To make streaming even more capable than what it can currently do, Google’s project stream will be much more demanding than just streaming your average day video. Project stream is Google’s way of pushing the limits when it comes to streaming in a good way. It is a test of sorts to see how far streaming can actually go. Our current day streaming has come a long way since only a few years back. But now for the ultimate test in project stream Google plans on streaming a blockbuster game. To really push the boundaries in project stream, Google has come up with a way to stream a blockbuster game and this is no ordinary game either. 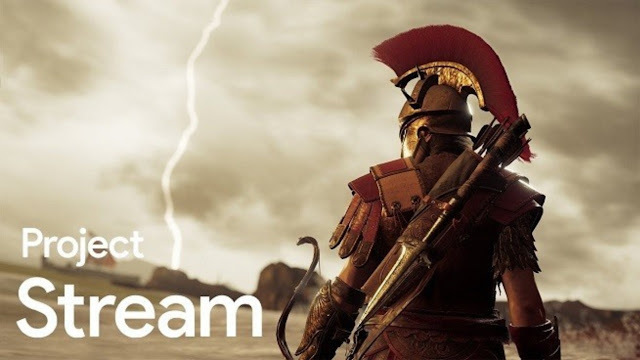 The game chosen for project stream is one of the best known and highly played games- Assassin’s Creed Odyssey. The game may not be released just as yet but it is well on its way to becoming one of the most played games in the world. The game to- be- released by one of the best gaming publication houses out there- Ubisoft, is all set to feature as Google’s test on streaming with project stream. Who gets to be a part of Project Stream? The game is all set to reach Google’s project stream platform on October the 5th. For the duration of the project stream test, Google will select a certain number of participants to play the game for the duration of the project stream test. This will take place at no extra cost to the players. To play the game you have to be a US resident and aged above 17 years, plus (this goes without saying) you also have to have a working internet connection like say 25 megabits per second to play. This is besides there being other criteria which you can check out on Google’s help center. Streaming comes with its own set of problems like buffering and the annoying wait for that to happen. But this is when you watch something like a video. But when it comes to gaming it’s a whole different ball game. You have graphically rich content to stream and not only that, there can be no lagging and buffering, there has to be instant interaction between the player and what happens on screen. The only latency that is acceptable is a few milliseconds and no more. Plus if you take in graphics, that makes it a really complex process that Google hopes to overcome with project stream.